Kyocera Stadion is a multi-purpose stadium located in the political capital of Netherlands, The Hague. Designed by architects Zwarts & Jansma, the 2007 built stadium is primarily used for football matches of local team ADO Den Haag and has a current capacity of 15,000. Kyocera Stadion was constructed over a two year period between 2005 – 2007 in order to replace ADO Den Haag’s Zuiderpark Stadion which the club first moved to back in 1925. With the last major renovations occurring in the 1970s, Zuiderpark was becoming increasingly outdated and expensive to maintain with little room for expansion and thus the club sought to move to new facilities at a more spacious out of town business and retail park. 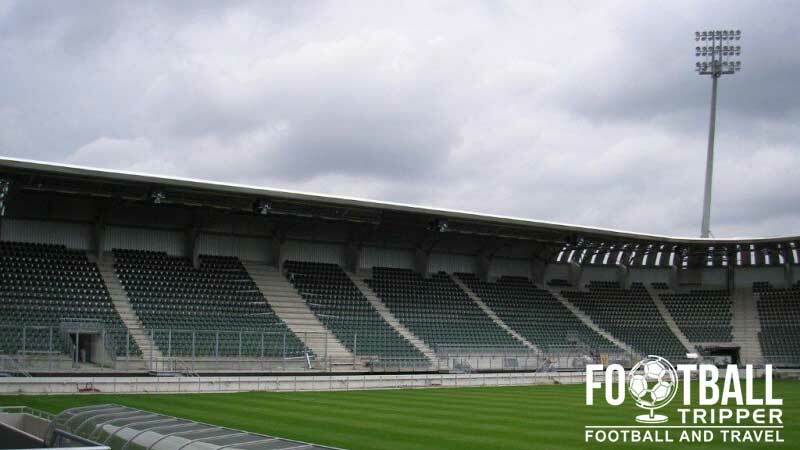 Constructed at a cost of 27 million euros, the opening ceremony was held on the 28th July 2007 with the inaugural match held against a team of amateur players from the local Haaglandse region. Designed by Zwarts & Jansma Architects, the ground is capable of being expanded to 27,000 seats with the addition of a second seating tier similar both AZ Alkmaar and NAC Breda’s stadiums. 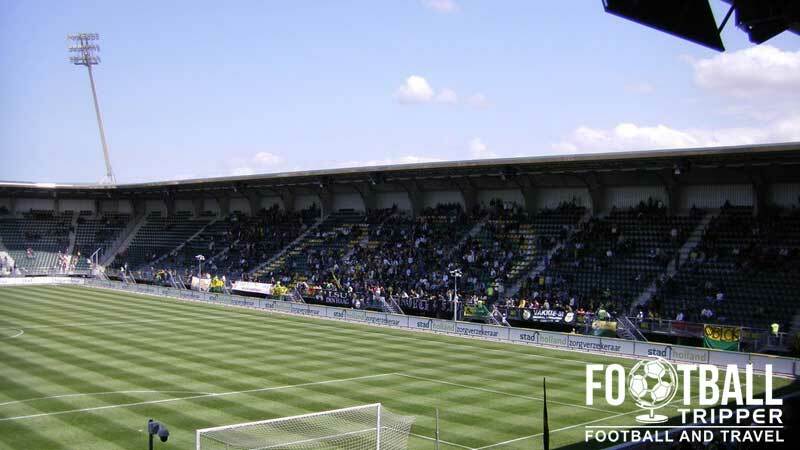 Unfortunately expansion plans have yet to be realised as ADO Den Haag were relegated during Kyocera Stadion’s inaugural season. 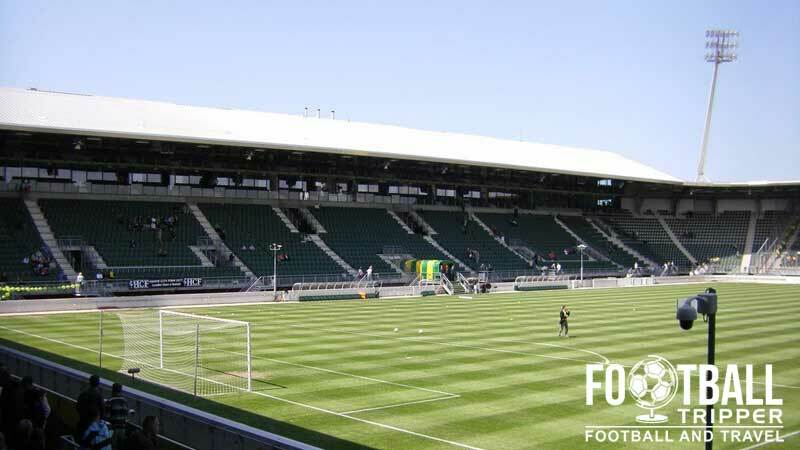 It wasn’t until the 2010/2011 season when sell-outs became a regular occurrence, with the previous attendance record set against SBV Excelsior as Haag fought hard to consolidate their place in the Eredivisie. 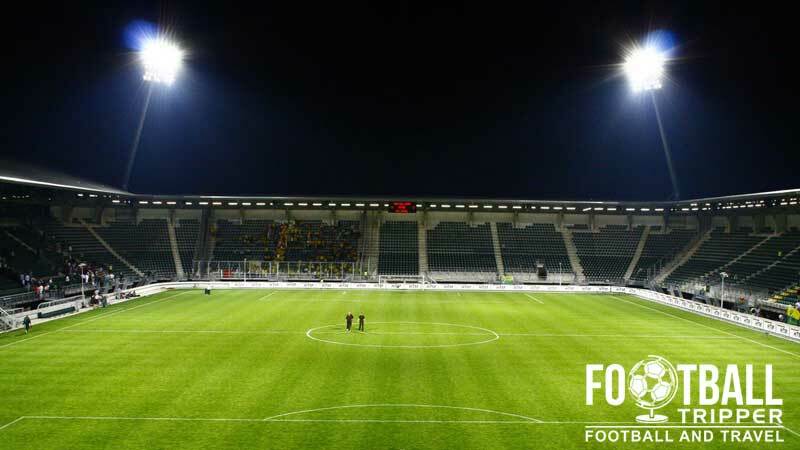 The ground was initially known as ADO Den Haag Stadion but the naming rights were put up for sale after the club encountered financial difficulties during the 2008/2009 season. Japanese electronics company Kyocera purchased the naming rights although some fans prefer to call it the Aad Mansveld stadion after the club’s legendary former defender. Kyocera Stadium is comprised of four stands: North, East, South and West. 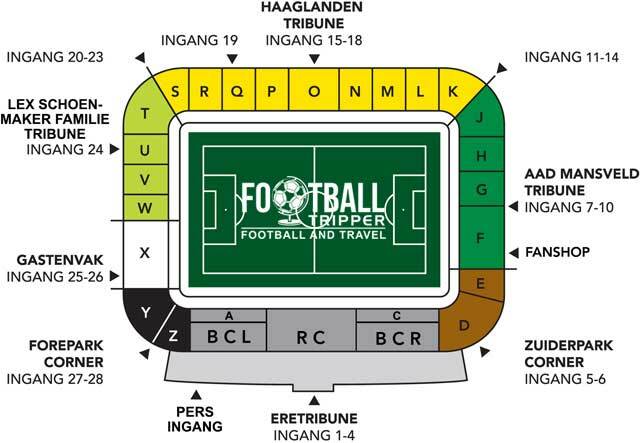 Away fans are housed within section X of the western most block of the northern goal-end as marked by the colour white in the above seating plan. The Gastenvak is separated from the home fans by a section of metal fencing although it doesn’t restrict views of the action on the pitch. With the exception of Ado Den Haag’s online store, the club shop at Kyocera Stadion is easily the best place to browse official merchandise of The Residentionclub. Please note that the fanshop at the stadium is closed on Mondays, Tuesdays and Sunday! On Matchdays the shop always opens two hours before kick-off. Guided tours of the facilities at Kyocera Stadion can be arranged by sending an email to [email protected] Costing a bargain €9.95 per person, and typically lasting one hour not including time spent in the new museum, stadium tours of Kyocera are a perfect way for any football fan to spend the afternoon. For a complete range of tour options and available dates please visit this page on the official website. Tickets to see ADO Den Haag can be purchased via the usual channels including online (you can then print at home) and from the box office located within the entrance of the main stand (Tuesday to Friday between 12.00 pm – 6.00 pm). Please note that there is a surcharge of €2.00 for all tickets purchased on matchdays in person in order to help offset the increased staffing costs and to alleviate congestion. The ticket offices around the ground are open for three hours before kick-off. Kyocera Stadion sits approximately 7.4 km east of The Hague’s traditional centre, adjacent to the interchange where the A12 (the main road into the city) meets the A4 and E19 motorways. It’s not very practical for Football Trippers to walk to and thus many choose to get the overground train service as outlined below. There are a total of four onsite car parks located at Kyocera Stadion with car parks P1 and P4 specifically made available on a first come first served basis on matchdays at a cost of €10.00 per vehicle. The car parks typically become locked three hours after the full time whistle so there’s no need to rush. The closest train station to the stadium is Den Haag Ypenburg however it’s predominately served by commuter lines and isn’t quite as convenient as the metro as outlined below. Within The Hague there are two main railway stations: Hollands Spoor (HS) and Centraal Station (CS). Located less than 1.5 km apart, they serve different routes and are designed to be complimentary rather than competing stations. The platform of the Forepark Metro Station. The stadium is served by the Forepark Metro station which is located less than 15 minutes north of Kyocera Stadion. It is served by frequent matchday services on lines 3 and 4 which can be caught from the city centre. The bus stop outside Ypenburg Train Station has regular service from the number 30 buses which transverse around The Hague. The city of Hague where ADO Den Haag are based shares an airport with Rotterdam known simply as “Rotterdam The Hague Airport”. It is located 23 km south of the city and is served by numerous International flight carriers. Located out of town unless you have a rental car the two nearest hotels (Mövenpick and Van der Valk) aren’t really accessible. Thankfully back within the city centre of Netherlands’ political capital you have plenty of accommodation options to suit all budgets. Three such well priced and centrally located options are: Stayokay Den Haag, Hotel Ibis and the easyHotel which is a no frills option like the airline.